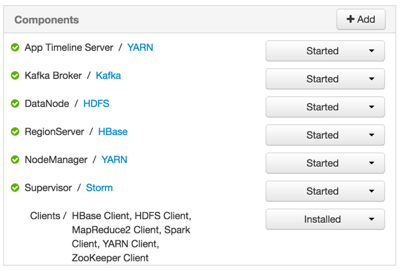 All Hadoop-related nodes running HCP must meet operating system, HDP, and cluster requirements. Each of the Hadoop Slave and Master nodes must meet the minimum specifications. To determine the supported version for each service, refer to Ambari, and choose Admin > Stacks and Versions. Each of the following components must be installed on at least one node. The YARN ATS must installed on the master node. All other services in the list should be installed on multiple nodes. For security reasons, no other workloads should be running on the cluster.